The 18-year-old died on Tuesday night at Dr George Mukhari Academic Hospital in Ga-Rankuwa‚ outside Pretoria‚ eNCA reported. 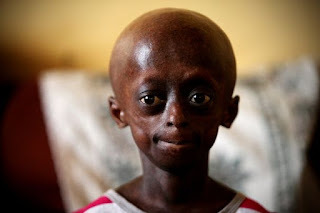 Phalatse was one of two South African girls living with Progeria‚ a rare genetic condition that causes rapid ageing. She described herself as “the first lady” after she became the first black child diagnosed with Progeria. Her death comes shortly after she met President Jacob Zuma at his official residence to mark her birthday‚ which was on March 25. Phalatse had requested the meeting‚ where Zuma presented the teen with a bouquet of flowers and a birthday cake. The presidency said at the time that the Jacob G Zuma Foundation would work with the Ontlametse Phalatse Trust to grant her other wishes‚ which included a home‚ transport and improved medical care. She was regarded as an inspiring figure and a miracle child after outliving doctors’ predictions by four years. Phalatse’s family is expected to release a statement later on Wednesday morning.